My favorite meal has to be breakfast which I am not at all a morning person even when I wake up I am not ready to eat. So a lot of times the only way I get my Breakfast is by making it at home. Thanks to Denny's I can eat out and have my favorite meal whenever I want. Denny's has a huge line of Breakfast items, me and my family went out the other night for Kids Eat Free, both me, my husband and 2 of our kids ordered breakfast. I enjoyed a nice Moon Over My Hammy omelette and my husband had the Philly steak omelette. The kids enjoyed a sampler plate which came with eggs, bacon, sausage, and pancakes off the kids menu! 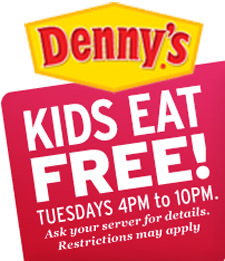 Denny's has a lot of benefits first they serve Breakfast all the time, 2nd they are opened 24/7 and 3rd if you have kids they eat free at all Denny's on Tuesdays and one other night but you have to call your local Denny's to find out when. It's a great deal for my husband and myself because with the 5 we rarely get to eat out but with Denny's Kids Eat Free we are able to go out and end up saving money than if we made dinner at home. Kids eat free on Tuesday nights from 4 to 10 PM with the purchase of an adult entrée of $4.00 or more. Denny’s is an affordable option for any family meal, with regular kids’ meal pricing at around $3.29. There are over 1,600 Denny’s in the United States, so to find the one nearest you, visit http://dennys.com/#/location. Enter to win a $25 gift card and 2 Kids cupcake cups full of candy. Contest ends July 13th! Open to U.S. residents only.